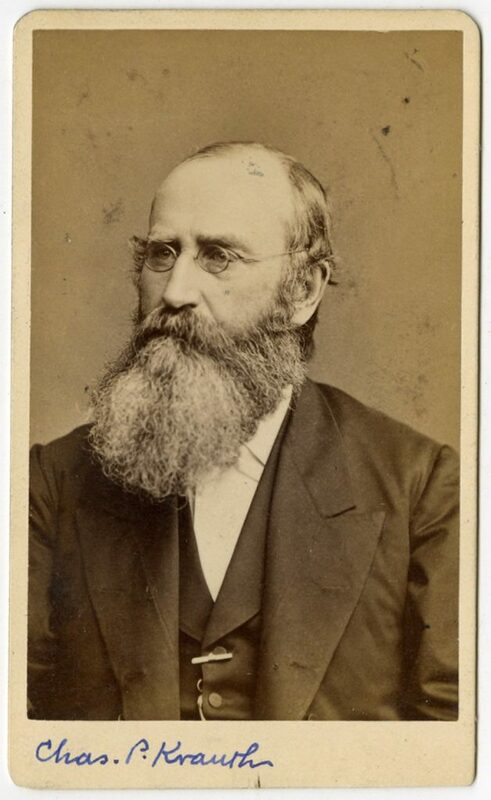 Charles Porterfield Krauth was born in Martinsburg, Virginia (now West Virginia), on March 17, 1823, the son of Dr. Charles Philip Krauth, a well known Lutheran Minister who received an honorary degree from the University of Pennsylvania in 1837. The younger Krauth graduated in 1839 from Pennsylvania College (now Gettysburg College), where his father was serving as president; he then entered the Lutheran Theological Seminary at Gettysburg. After his 1841 graduation and 1842 ordination, Charles Porterfield Krauth served congregations in Baltimore, Virginia’s Shenandoah Valley, St. Thomas in the Virgin Islands, and Pittsburgh, Pennsylvania. In 1859, Krauth relocated to Philadelphia to serve as pastor of St. Mark’s Church. Two years later he resigned his parish ministry to become editor of the Lutheran and Missionary, a theological journal which advocated a return to a more literal reading of Martin Luther’s Augsburg Confession. Conflict ensued between the leaders of this conservative confessional revival and the “American Lutherans” who, in their pursuit of broader ecumenical relationships in America, advocated a looser interpretation of the Augsburg Confession and other confessions found in the Book of Concord. The resulting schism led to the 1864 establishment of the Lutheran Theological Seminary at Philadelphia; Charles Porterfield Krauth was asked to lead this new seminary and to serve as its first professor of systematic theology. He also wrote the founding document and permanent constitution for the new General Council set up as alternative to the “Americanized” General Synod; he served as its president from 1870 to 1880. Krauth was also influential at the University of Pennsylvania during his decades in Philadelphia. Krauth was appointed professor of intellectual and moral philosophy in 1868, a position he held until his death in 1883. He also served in the position of vice provost from 1873 to 1882. Dr. Krauth published over a hundred theological works, including The Conservative Reformation and Its Theology: As Represented in the Augsburg Confession, and in the History and Literature of the Evangelical Lutheran Church (1875); he was considered to be one of the most prominent Lutheran scholars of the late 19th century. Krauth married Susan Reynolds in 1844 (she died in 1853) and Virginia Baker in 1855; he had five children.